Chikungunya virus (CHIKV) is an arthropod-borne alphavirus primarily transmitted by Aedes mosquitoes, which has been capable of causing explosive outbreaks of human disease in over 60 countries in Asia, Africa, Europe and the Americas. CHIKV consists of three structural proteins and four nonstructural proteins. 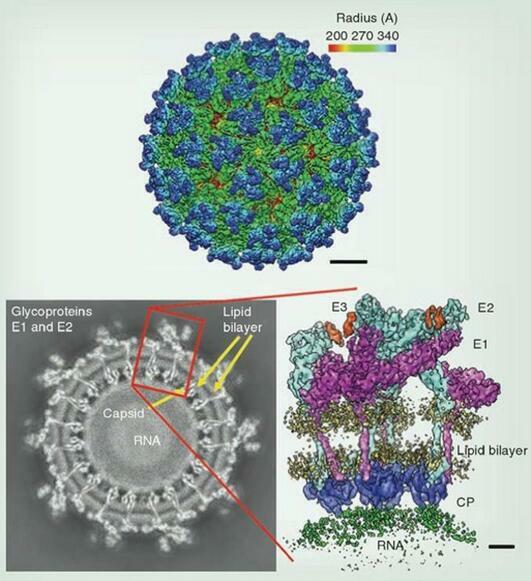 The capsid and two envelope glycoproteins: E1 and E2 are the structural proteins. E1 and E2 proteins both have a molecular weight of roughly 50kDa and form a heterodimer anchored in the membrane. The mature vision contains 240 heterodimer spikes of E2/E1, which after release, bud on the surface of the infected cell, where they are released by exocytosis to infect other cells. CHIKV is transmitted by the bites of infected female mosquitoes from human to human. The mosquitoes most commonly are Aedes aegypti and Aedes albopictus. Chikungunya virus infection causes an illness with symptoms similar to those of the dengue fever with an abrupt onset of fever frequently accompanied by joint pain. Other common signs and symptoms include muscle pain, headache, nausea, fatigue and rash.